Canadian astronomers will soon use an amazing new telescope to unravel the mysteries of our origins -- from planets to the largest structures in the universe. Astronomy has long grappled with telling the story of our origins and our relationship to the Universe as a whole. Over the past few decades, we developed the scientific narrative of our origins from the Big Bang up through the present day. However, many links in that story are inferences: they must have occurred since we are here, but we have been unable to actually observe the systems representing these connections -- astronomy’s own “missing link” problem, if you will. In the Atacama desert of Chile, 5,000 metres above sea level, astronomers from across the world are now building a revolutionary new telescope that may help see that missing link. The desolate landscape, where annual rainfall is less than 100 millimetres, is precisely what attracts astronomers such as myself because the dry atmosphere is nearly devoid of water vapor. We cannot look back into our own history to see how our own solar system formed. However, a vast number of other solar systems are in the million-year-long process of formation right now. So, we will see the story of our solar system’s birth playing out across the hundreds of systems in our galactic neighborhood.At lower, wetter sites, the water vapor blocks the short-wavelength radio waves from the cosmos that the Atacama Large Millimetre/submillimetre Array (or the easier-to-swallow ALMA) will observe. When ALMA commences observations in 2011, it will enable astronomers unprecedented insight into our origins. Observations with current telescopes reveal some evidence for nascent planetary systems around these stars, but the new technologies and unparalleled location for ALMA will for the first time identify forming planets -- known as proto-planets. Like putting on our glasses in the morning, we will have a new, crisp view of star and planet formation. 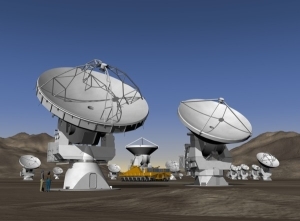 The secret to ALMA’s much improved vision is that many of ALMA’s 66 antennas, ranging in size from seven to 12 meters in diameter, can be moved around. Changing the relative positions of the antennas allows different modes of observing -- a bit like using a zoom lens on a camera. ALMA will form images by continuously combining signals from each antenna with those from every other antenna. There are 1,225 such antenna pairs, with each antenna receiving radio signals from the astronomical object being observed. The array also relies on the world’s most extensive superconducting receiving system, which gathers the astronomical signals, and extensive computing support. ALMA’s processors will construct astronomical images by digitizing and processing receiver data at a rate of over 16,000 million-million operations per second. Catching solar systems in the act of formation will represent a major discovery and resolve outstanding questions about how, exactly, planets form around stars. ALMA’s vastly improved capability to peer into the dusty, cold clouds of molecular gas where stars form is central to this discovery. Proto-planets are not the only missing link that ALMA will study. This new facility will unlock access to many other unseen processes in the Universe. With the telescope, I personally will be studying how the star-forming molecular clouds of gas themselves come to form within galaxies. Using ALMA, we will be able to observe this process in other galaxies, which is crucial since our embedded perspective in our own galaxy prevents us from seeing this happening nearby. Other astronomers will turn their attention to the most distant observable galaxies in the Universe, seen in the infancy of the Universe thanks to the finite speed of light. Studying these proto-galaxies will answer abiding questions about the forces that shaped our own galaxy. ALMA is revolutionary in other ways. In addition to opening up new sections of the radio spectrum to deep observation, it will be more than 10 times larger and far more sensitive than any preceding radio telescope operating at these wavelengths. 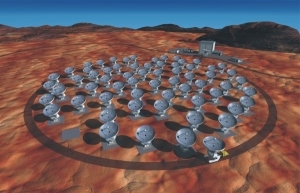 ALMA also represents the largest collaborative effort in ground-based astronomy to date. Canada participates with the United States, European governments, Japan, Taiwan and Chile in the construction of the array. Groundbreaking receiver technology has been developed at the Hertzberg Institute for Astrophysics in Victoria, B.C., and is incorporated in the array. In five years, the story of how we came to be will be illustrated with observations from ALMA and many lingering questions in this narration will be answered. And, as is the nature of science, many new questions will await us.